My fiance's parents passed away a few years back, and she inherited an absolutely stunning timepiece that we are trying to identify. 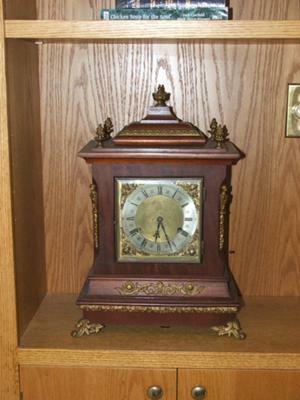 The piece is in perfect working order, and is marked on the inside of the rear door as "New Haven Clock Company". After doing some research, I believe it may be an 8-day Shelf Clock. I know no other details except that it is in pristine condition, excellent running order, and the damn thing weighs a ton and a half.